Liz's Paper Loft: The Queen's Royal Court Blog Hop! there is a give away there also! Welcome to the The Scrapbooking Queen's Royal Court Hop with A-Manda Creation! You should have arrived here from sweet Kassidy's blog. If not head over to the Queen's blog for the start, you know you don't want to miss a thing! Photo Shop Elements 9 to open up and size pattern to paper and the monkey element. Then print on to white cardstock. Then I just used the paper as anyother paper. The biggest tip I can give you, is to make sure that you start your project in PSE with a resolution 300. So simple and so cute! If you've never tried digi kits don't be afraid, there are so many videos on YouTube to help you through it! 2. For an extra entry go to A-Manda Creation check out her kits then come back here and tell me which kit is your favorite and you just might win it! Liz this card is so adorable!! I really love that little monkey. Such an adorable card! 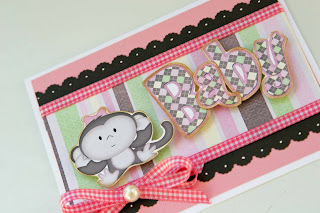 Thank you for showcasing the sweet monkey kit so beautifully! Great kit. Love your little monkey project! monkeys and babies go together!! Love it!! I would love to have a Christmas kit!! This is adorable! I think I may have to try one of these kits!